Cause of death is clear: two gun shots to the chest. Archer notes odd burns and lesions on the corpse. An autopsy reveals that the man was terminally ill when he was killed. An educated guess suggests the victim was exposed to enough radiation to burn his skin and damage his internal organs. How this might have happened becomes clearer once the police discover the identity of the dead man: Spode, a physicist exploring the possibility of atomic explosives. SS Standartenführer Oskar Huth considers the case important enough to fly to London to take personal charge. Seconded to Huth, Archer is under strict orders to share nothing he learns with anyone else, not even—especially not—his current boss, Fritz Kellerman. The war effort is important but not as important to Huth and Kellerman as their bitter rivalry. Either Nazi officer could order Archer shot and there’s no way to satisfy one boss without outraging the other. Spode’s research papers were burned to keep them out of the wrong hands. This would have been a cunning ruse if only Spode had not been the careful sort of chap who makes carbon copies of important documents. Even as the Nazis secure their hold over their new empire, they are making plans for the next war, a war in which atomic explosives may play a crucial role. In such a world, Spode’s copies are a treasure literally worth a king’s ransom. The German won the Battle of Britain in this novel. More importantly, they’ve deferred Operation Barbarossa (the invasion of Russia). All of the resources that the Germans would have thrown at Russia are still available to Operation Sea Lion (the invasion of Britain). Given all those counterfactuals, it still seems a bit unlikely (at least to me) that the Germans could have pulled off Sea Lion. Deighton wisely refrains from providing too many details about the German victory; we are to accept it as given for the purposes of the plot. 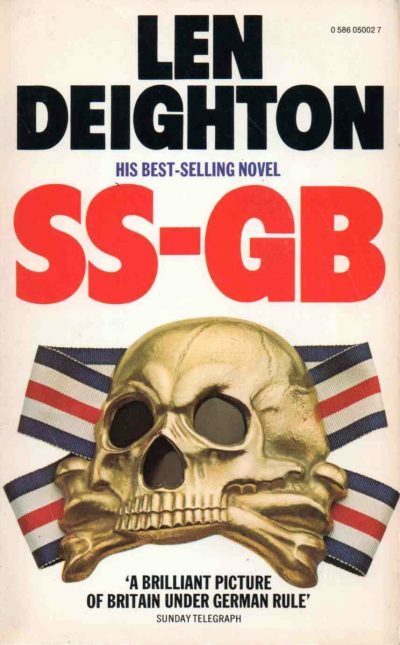 I gather from my friends in the used book trade that Len Deighton’s star has faded somewhat, but at one time he was one of the big names in espionage procedurals, comparable to John le Carré. His works are not limited to thrillers (he has written non-fiction on subjects from the Battle of Britain to cuisine ) but as far as I know this is the only work of science fiction he has written to date. It is also the book that inspired me to start collecting his books. Deighton is not the only person to have written about policemen working under Nazi rule: Harris’ Fatherland features a German detective who is far too successful for his own good at investigating a series of brutal murders. More recently Jo Walton’s Small Change trilogy focuses on an inspector caught up in the unsavoury politics of Fascist England. It’s easy to see why the idea would appeal. In most procedurals, the police restore order after some miscreant creates havoc in pursuit of personal gain. A policeman in a fascist region may be serving a very dark sort of order, order composed of midnight raids, mass arrests, and hasty executions. A decent sort of person might well find themselves torn between duty to their job and duty to something more important. In Archer’s specific case, Deighton adds other, potentially lethal, complications to Archer’s moral quandary. In this novel, the German war apparatus, so often depicted as a gleaming, efficient machine, is shown to be a snakes nest of corrupt opportunists more concerned about their short term goals (which includes sticking it to their rivals) than winning the war. The resulting, messy, lethal Nazi internal politics have Archer in a no-win situation. If this were not bad enough, Archer’s job makes him a traitor in the eyes of the partisans. Even if he survives in the short term, his long-term prospects could be very grim.